Cesar is using Smore newsletters to spread the word online. The island fox lives on six of the eight Channel Islands off the coast of southern California. Each island population is considered a unique subspecies. The Santa Catalina Fox is considered the largest in size and the Santa Cruz is the smallest. It is the largest of the Channel Islands' native mammals, it is an omnivore feeding on large amounts of insects and island deer mice along with fruits. 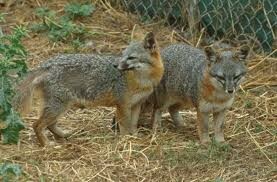 The island foxes on Santa Catalina became endangered in the late 1900's when a racoon escaped from a boat and passed canine distemper to the foxes, 90% of the foxes died form the disease. On the northern islands of San Miguel, Santa Rosa and Santa Cruz the fox population declined due to the decrease population of bald eagles. The bald eagles kept other eagles from nesting on the islands after their decrease in numbers due to the golden eagle came to the islands to feed on the island fox. Surviving Island Foxes were brought to captive breeding facilities as threats to the island fox were removed. Over 40 golden eagles were captured and relocated. Golden eagles were introduced to the islands. "Friends of the Island Fox: About Island Fox." Friends of the Island Fox: About Island Fox. N.p., n.d. Web. 09 Dec. 2015. United States. National Park Service. 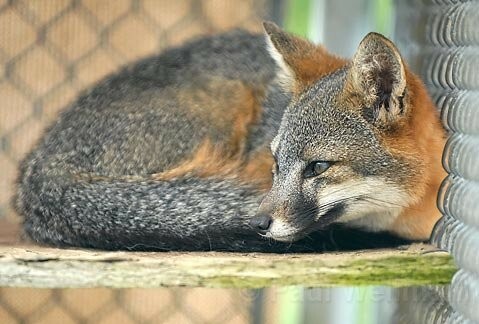 "Island Fox." National Parks Service. U.S. Department of the Interior, 07 Dec. 2015. Web. 09 Dec. 2015.